Why your business needs a web development and a web developers? By 2020, almost half the world’s population will be on the internet. Almost 92% more than the number in 2005. What does it mean for the businesses in across the globe? The implications are simple, having a digital presence is more than crucial for businesses today. Today most customers look for, research and review a product online. If your business is not read on there are high chances that you would miss reaching out to these customers. If your business is online, you have higher chances of reaching out to a much wider population even outside of few kilometres of your geographical destination. Today’s customers rely on the web to find out more information about your business. In most cases your website is the first impression your customers will have about your business. A SEO friendly website means you appear before your competitors when customers are searching for products or services related to your business. Which means customers see you first, they reach out to you first. A website will ensure that you have a detailed version of the services your business offer online and it reaches out to your customers regardless of where they are. How many times it has happened that your sales team did not have a brochure or a detailed document which defines your services to the client. A website eliminates the need of having a hard copy brochure all the time with them. As the website becomes an always accessible virtual business catalogue for your business. Irrespective of which business you operate in, your website serves as another sales channel for your business. If you are a retail store, your website is an extended branch of your store, if you are an restaurant or a small cafe, your website will help you get more orders, if you are a B2B business your website will help you generate more enquiry. Even if you are an individual and with your own powerful online presence can help you earn more money through ads which appear on your website. Unlike what most businesses think, a well designed and SEO friendly website will make serve as a promotional and communication channel for your brand. If done well you would need to spend less through other advertising channels, which are most of the times more expensive than having a website. Your website is an excellent medium to reach out to your customers and solve their queries and address their grievances as well. It also reduces the amount of investment you would need to do on customer care and support. One such example is Amazon’s customer care and support who are reachable across various online channels – email, chat bots etc. What are the popular types and categories of web development? The development of Web applications is not limited to smartphones or tablets rather this type of application is designed to run on any browser, either on fixed computers, laptops or mobile devices. In this article, we will classify the different types of web applications. This classification is based on how web apps show the content they accept. Based on this, we have up to 6 different types of web applications. This type of web applications is very common among the content pages: personal blogs, corporate blogs, professional blogs, news pages, articles, media, etc. As the web technology advances in the future, businesses are moving towards innovative and state of the art website designs and development techniques. Not only these websites are highly attractive to look at they are also highly functional. With the advent of advanced technologies like AI, IoT, chatbots, Machine learning, etc. organisations are stepping up their game in website development every single day. The most critical aspect of website development is website programming. There are many website development programming languages which helps in building a website for your business. Website development is the process of designing and developing a website. A website can be developed as a one page website to one having hundreds of pages with complex functionalities. In the past few years CMS or Content management Systems like WordPress, Drupal etc. have become popular platforms for website development. CMS system serve as the mid step between user and database. Before embarking on the journey of web development choosing the right programming language is critical. So, what are best programming languages that are used in the website development around the world? Before talking about the best programming languages in the world let’s understand what is meant by website programming languages. A programming language is the one which is used to manage and control different actions of a website. These languages are drafted and designed in such a way so that it can communicate and give instructions to a system and perform various functions and actions on the system. A programming language has 2 different kinds of components – the semantics and the syntax. While syntax is the form or the type, semantics define or are the meaning of these type or form. There are numerous programming languages around the world, and each of these languages are unique. However, most of these programming languages are meant for one work that is to help to write programs which are known as algorithms which can help web development. Abstractions – These are the rules that help in defining or marking the data structures and manipulate the way the commands on the system are executed. Function and target – As a programming language is used, developers have to do a some program writing work on their own as well. Further, the help of computer system is also required to perform the computation work and to control the algorithms. Further, the computer also monitors or some external devices connected to it like printer, robots, etc. 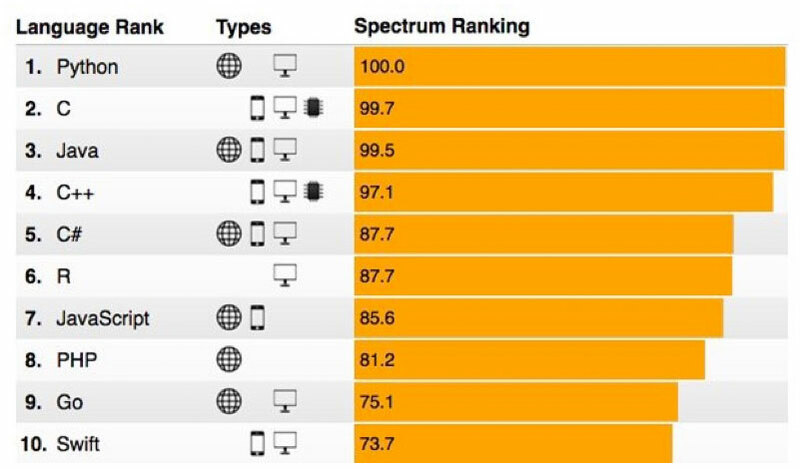 Expressive power – Most programming languages are classified by the computations that these languages are able to express. This trait of the programming languages are one of the most important traits of the programming languages. Platform on which the program will run on. The language you choose must be matched with your domain. The language you choose must be flexible so that more programs can be added to the language. Depending on your project size you should choose a language which can support a large or small project. One of the most important factors while developing a website is the structure. While choosing an structure ensure that it is in line with your business. If you are in a serious B2B business it is important to make sure your structure is not quirky or if you are a fashion brand make sure your map defines that. It is not enough to have a nice looking website, you have to make sure that the website is also functional and useful for your visitors. Before you get into development of your website, it is important to map how exactly your website will function. For doing that it is important to make a mock up design or a wireframe of the website is important. Also, the Google bot crawls through the content and the structure of the website to rank it into its search engine page. Therefore, it is important to have a well designed site structure in place. Most businesses develop website which are nice to look at, but do not convey about the services offered by the enterprise easily. For e.g. while most websites have giant ‘about us’ page they lack in relevant content on the services page. They will dedicate an entire page for the history of the company, they will forget about adding important informational resources on the page. It is important that depending on the business you gear up your website to provide the most relevant and important information about your business easily to the consumer. Most websites have a structure where the contact us information is not easily accessible. Now consumers who want to contact you directly and land on your website, it becomes extremely important to gear up your website so that these consumers can easily do so. Besides, it leaves a very bad impression about your business if you make it complex to contact you. It seems like you are not interested in the visitor. If you show you customers that you are not interested in them, they would also not be interested in your business. Hence make the contact information of your website easy to find. Further, also ensure that you have relevant information available on your website like email, phone no. address etc. Some enterprises also add number of their sales representatives on the website. Anyway, if you do not want to add phone numbers, make sure you do add basic relevant information on the website. Further, also ensure that you do not have copious contact us form on your website. It is important that you put yourself in the shoes of the visitor who is coming to your site. How would you want to navigate on a website, what are the most important things you would want to find on the website upfront. For eg. you would want to easily find out the services, contact information, FAQs etc. If the basic information is not accessible easily it can put off your customers. To make a website which is easily navigable, it is important to make a persona of your user who will come on the website and then create a design of your website. With the increasing number of website users across the worldwide, the usage of internet has also grown immensely. However, the growing popularity of internet has also given rise to the number of security risks as well. Make sure that the security measures of your website is robust. Make sure you have a proper SSL certificate on your website, especially if you are selling something online it is more than important to ensure stringent security measures on your website. 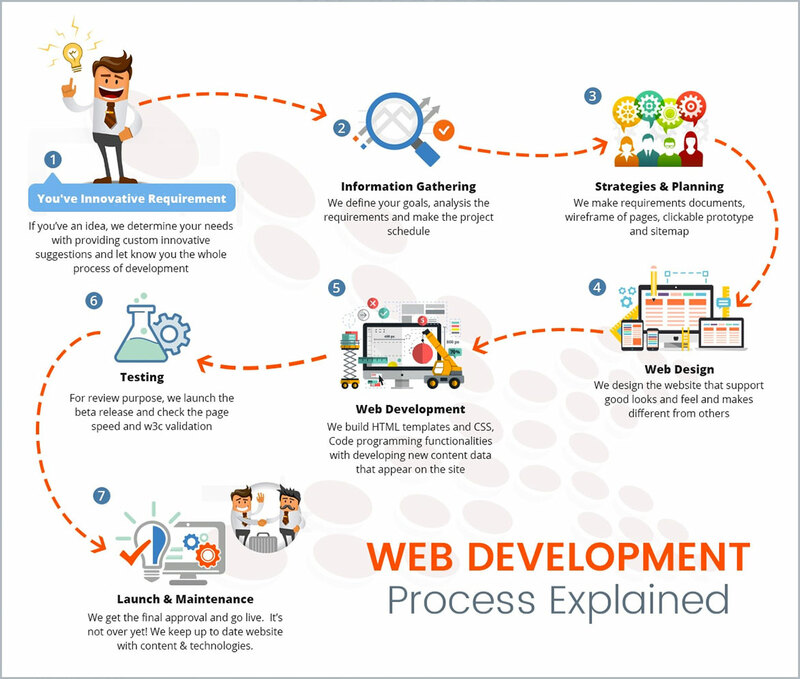 Web development can be an extremely gruelling process if not dealt with in a systematic manner. Most people think that creating a design and then coding is all that is required to finish a web development process. Designing and coding may be important aspects of website development. However, that is not all. There are many more steps towards successfully creating a website. Most of the times businesses do not understand their requirements well before they start working on their website development journey. It is important to map your requirements before embarking on the journey of website development. And, the first step towards mapping your requirements well is setting a goal. For e.g. if you are an eCommerce website, your goal might be get sales. If you are a software service provider your goal might be to generate enquiries. So on and so forth. Your requirements will be mapped accordingly. Website development can take forever if you do not define timeline for your project. Further, a prolonged website development process can keep increasing your cost of your project, especially if you hire an agency which is billing you on a resource and hourly billing based model. To ensure that your project completes on time establish a web development timeline and add milestones to the timeline. Building a Gantt chart also will help in building measurable timeline for your project. Tools like GantPRO can go a long way in helping you build a project timeline. Take enough time to understand your TG and define the purpose of your website. Gather information required about your audience, competition and the resources you would require about your website. This stage will help you gaging how much time would it take for other steps of the development process, hence spend enough time, at least 1-2 weeks on this step. Now, that you are clear about what you want to achieve from your website, it is time to create a skeleton of your website. This skeleton is called a wireframe. 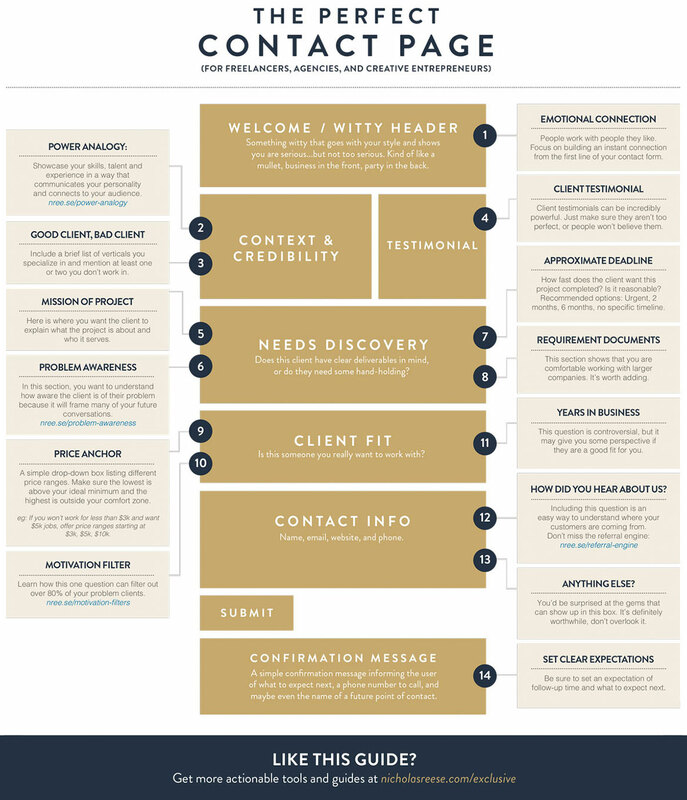 This will serve as a road map for your web development process. Now that you have identified how your wire frame looks like you should build how your website will look like in terms of visual. Build a mock up design and page layouts, get approvals from relevant people and finalise that with dummy content before you start coding. Now that you have finalise the design of your website and you exactly know the page layouts and how many pages would you require, you will have a fair idea about the amount of content you would require on your website. While you are creating content make sure you have relevant content that is useful for your visitors. Further, the content should also be keyword optimised. Now that you have all the relevant content and the basic design template of your website ready, it is time to give live structure to your website and start coding. It is the stage where you implement frameworks and add CMS systems to your website. At this stage you should also add different functionalities on the website. Once the website is created make sure you test each and every link thoroughly before it goes live. Spend at least a week or more if required, to test, rectify re-test and then rectify any issues on the website. Make sure all the function of your website are working properly before you take it live. Not that your website is live, make sure proper analytics code are set up and are tracking your website properly so that you can track the performance of your website and take relevant actions to improve it. Google analytics is a free and a must have tool which you should add for your website tracking. How to choose the best web development companies for your business needs? Website is an important aspect of your business. It is the first impression your customers have about your business, it serve as a sales engine, it is a branding and advertising tool and so on. It is more than necessary to choose the perfect website development partner for your website, who can turn your website development dream into reality, according to your vision. There are thousands of website development firms out there. You can find a website development agency in click of your finger tip, but making sure that you find the one who is perfect for your business will take a lot more effort and research then that. It is important to have a clear understanding of the purpose of your website, before you start looking for a partner. It will help in communicating this objective to your prospective partners, so that they can understand your objective clearly before they approach your business. Once you have a list of the shortlisted developers, look through their credentials. The first step towards going through a website developer’s credentials is going through their company deck. If they don’t even have that it is a sign that you are better off staying away from such developers. Further, don’t stop at assessing their credentials with the deck. Your website is an crucial part of your business, don’t shy away from digging deeper and asking for more information than what they show you. The elements that you have to look at are their clients, client testimonials, case studies etc. However, don’t be satisfied with these alone. Website development is an important part for your business, make sure you go the extra mile to identify the right development partner. Ask for the contact person of the enterprises the prospective agencies have worked with and speak to them personally. You have a certain vision for your website, make sure that the web development agency you are looking for has expertise to work on your website according to your vision. Further, you will also have to look if they have the basic expertise to take up your website development project. Also, what kind of websites they have developed in the past have they work on a similar business website like yours etc. Your website development partner will work with you day and night to develop your website. They will be the extended part of your enterprise much like your employees or the human resources of your company. Hence it is important that their work culture is in line with yours to make sure that the entire business development process happens harmoniously. It is important what are the communication channels the website development agency will use to communicate with your enterprise. Will there be a relationship manager or will you be interacting with the development team directly? How do they go about setting up job status meetings? Will there be scrum meeting daily, weekly etc. If you are working with offshore teams how would they work around the different time gaps. Will you be allotted an offshore teams etc. It is important to understand all these things to ensure a smooth completion of the project. Many businesses, mostly the small and medium enterprises choose to go with developers who charge them less. And, that is a big mistake. We can’t stress enough about how important your website is for your business. Going with a developer who charges very less means that either they are new to the business and their market value is thus less, or they don’t have enough expertise hence their market value is less. So, when you are choosing a website developer who is way cheaper than even the market standards, you are putting your business to a big risk. By choosing such a partner there are high chances that your project will be miffed. Website development is an area where you get exactly what you pay for. However, but that doesn’t mean that you have to pay through your nose to get a website developed. Understand what are the market rates, ask friends who have got a website developed on how much they have paid, then understand how much can you spend on a website. Basis all these factors go about looking a website development agency. Make sure you don’t pay too less, or too much, you pay just the right amount to get the right website. Upvotes will help you to find the perfect one easily. Start searching the best web development companies now with us. Choose your Best Web Development Companies by Country wise locations. Choose your Best Web Development Companies by Cities wise locations.